How do contaminants affect wildlife and their habitats? How does changing sea level affect our coasts? Trending up or trending down? Hint: first I have to know who you are. How do changes in local conditions affect amphibians? Patuxent Wildlife Research Center (PWRC) produces innovative science to support natural resource management and meet our nation’s most pressing conservation challenges. PWRC research topics include bird population dynamics, ecotoxicology, and the development of quantitative & decision analysis tools. We conduct several national programs, including the Bird Banding Lab and the Breeding Bird Survey. USGS Patuxent scientists are providing managers with tools for improving detection and for proactively mitigating the impacts of amphibian diseases. 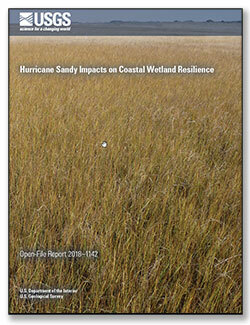 A decision-support framework was developed in collaboration with USFWS to identify approaches to maximize salt marsh management benefits at Bombay Hook National Wildlife Refuge. A recently published scientific article uses USGS Bird Banding Laboratory records to evaluate hotspots of Black Brant band recoveries. Newest member of the Bird Banding Laboratory has a long history with birds. One Turkey Vulture’s 3,000 Mile Journey. Cahoon, D.R., Olker, J.H., Yeates, A.G., Guntenspergen, G.R., Grace, J.B., Adamowicz, S.C., Anisfeld, S., Baldwin, A.H., Barrett, N., Beckett, L., Benzecry, A., Blum, L.K., Burdick, D.M., Crouch, W., Ekberg, M.C., Fernald, S., Grimes, K.W., Grzyb, J., Hartig, E.K., Kreeger, D.A., Larson, M., Lerberg, S., Lynch, J.C., Maher, N., Maxwell-Doyle, M., Mitchell, L.R., Mora, J., O’Neill, V., Padeletti, A., Prosser, D., Quirk, T., Raposa, K.B., Reay, W.G., Siok, D., Snow, C., Starke, A., Staver, L., Stevenson, J.C., and Turner, V., 2019, Hurricane Sandy impacts on coastal wetland resilience: U.S. Geological Survey Open-File Report 2018–1142, 117 p., https://doi.org/10.3133/ofr20181142. Sykes, Paul W. Jr; Freeman, Mary C.; Sykes, Joan J.; Seginak, John T.; M. David Oleyar; Egan, Joshua P.